Thumb base arthritis is a common cause of thumb pain in many patients. 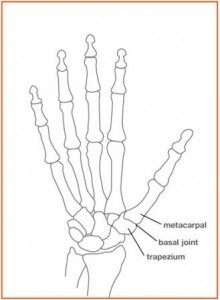 At the base of the thumb is a specialized joint called the carpometacarpal (CMC) joint. This joint normally allows for a wide-range of thumb motion. The ability to touch the thumb to the small finger, known as “opposition,” is a function which distinguishes our hands from the hands of many animals. Because of this joint mobility, the base of the thumb is exposed to a large amount of “wear and tear” stress. Over time, this joint can “wear out” or become arthritic. The normal smooth cartilage wears away, leading to “bone-on-bone” contact. This can result in pain, weakness, and decreased thumb range of motion. Previous injury and family history of osteoarthritis may also contribute to this. Thumb CMC joint arthritis is a common form of degenerative joint disease, also known as osteoarthritis. It is one of the most common places to get osteoarthritis in the hands. Osteoarthritis is more common the older we get, and it is part of the usual aging process. How do I know if I have thumb arthritis? Most people notice a gradual onset of symptoms over time. Pain is usually located at the base of the thumb, but may radiate into the wrist, forearm, or hand. At first the pain may feel like a dull “ache” but it may become worse over time. Occasionally, sudden “sharp” pains can occur in the thumb. Activities such as opening a jar, turning door knobs, knitting, or using a key can be painful. Some people feel that they do not have the strength they used to have in the hand. Some people notice swelling or a bump at the base of their thumb, which may be painful to the touch. How is thumb CMC joint arthritis diagnosed? The diagnosis is made after reviewing the patient’s history, performing a physical examination, and getting x-rays. X-rays can show loss of articular cartilage, joint deformity, bone spurs (also called “osteophytes”), subchondral cysts within the bone, and narrowing of the joint space. There is no cure for arthritis but the symptoms can be relieved. Non-operative treatment is usually helpful for most patients. Over-the-counter anti-inflammatory medications such as Naproxen (Aleve), Tylenol, and Ibuprofen (Motrin) can help reduce the pain. A thumb brace is often helpful during activities. Occupational therapists can also make a custom brace or thermoplast splint. Steroid injections (cortisone shots) into the thumb CMC joint can reduce pain temporarily. Glucosamine and Chondroitin Sulfate arthritis supplements may reduce pain in patients with hand osteoarthritis. These supplements are sold over the counter without a prescription. Some patients find relief from topical heating pads, warm water soaks, or topical anti-inflammatory creams such as capsaicin. When non-operative treatment has failed to reduce symptoms to a manageable level, surgery may be offered. 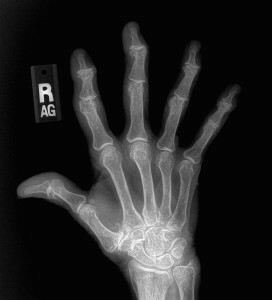 The decision to undergo surgery is based primarily on your symptoms, not on the severity of the arthritis on x-rays. Many patients can avoid surgery with adjusting their activities, using oral or topical medications, and using a thumb brace. What surgery is recommended for arthritis? Thumb CMC arthroplasty surgery is a commonly performed hand procedure. The surgery is performed on an outpatient basis. General anesthesia can be avoided by using a temporary nerve block (regional anesthesia). During surgery, the arthritic bone at the base of the thumb (trapezium bone) is removed. This procedure eliminates the bone-on-bone grinding pain. In addition, a tendon from the patient’s forearm can be used to fill the space at the base of the thumb and/or reconstruct the ligaments at the thumb base. This tendon acts as a biologic spacer or cushion for the thumb. These options will be discussed with you in the office. What are the results from thumb arthritis surgery? Thumb CMC arthroplasty has been performed with excellent results since the 1950s. This surgery has a proven track record in published studies with good long-term outcomes for the majority of patients. Most patients report less pain, improved grip strength, and better function after surgery. What are other surgical options? Some surgeons insert artificial or manufactured implants such as metal, silicone, or fiber in the base of the thumb. This introduces the risk of implant loosening, breakage, and rejection. Using artificial implants has not been shown to be superior than biologic spacers. Therefore, I do not recommend artificial implants during this procedure. Your wrist and thumb will be protected in a plaster splint after surgery. This is removed in clinic along with the stitches after 2 weeks. At this point, patients are provided a custom-made splint or cast which they wear for an additional 4-6 weeks. I recommend avoiding heavy use of the hand or strengthening for approximately 8 weeks after surgery. Hand therapy is helpful to improve range of motion and strength during the recovery.